Set in a charming tranquil location yet only a two minute walk to the restaurants, bars & the River Rance. A mirror image of the well known Rue Jerzual which is virtually opposite . 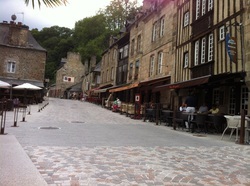 The ancient Rue De L'Abbaye at the port of Dinan is an idyllic place to stay. The gite is situated on a small cobbled road but has the benefit of a parking space within the garden which overlooks the Ramparts of Dinan & has fantastic views from the main bedroom. Beautifully renovated with oak beams & timber floors, the house has direct access from both levels to the gardens. Fully equipped with everything you will need as well as an abundance of information on activities & places to visit. The gite sleeps 4 comfortably in two bedrooms.